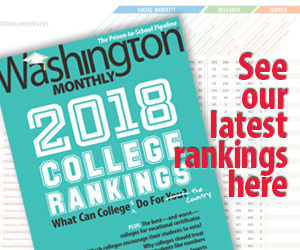 Washington Monthly | Will the New Common Core SAT Close the Privilege Gap? Will the New Common Core SAT Close the Privilege Gap? High-school students who enjoy obscure vocabulary and puzzle-like math problems might want to sign up for the SAT now, before the 89-year-old college admissions test is revamped this March to better reflect what students are learning in high school classrooms in the age of the Common Core. While other standardized tests have also been criticized for rewarding students who’ve mastered the idiosyncrasies of the test over those who have the best command of the underlying substance, the SAT – with its arcane analogy questions and somewhat counterintuitive scoring practices – often received special scorn. Even David Coleman – the president of the College Board, the non-profit that designs and administers the SAT – readily admits that for far too long students who could afford special classes and tutoring on the test’s tricks, programs that could cost tens of thousands of dollars in some parts of the country, had an unfair advantage. Coleman – who is often called the architect of the Common Core – arrived at the non-profit in 2012 and has since been on a campaign to make a SAT that would incentivize students to take rigorous high school classes and not just the best test prep courses. While much was made of the last major revision to the SAT in 2005 – which added a mandatory essay section to the traditional math and reading sections, thus raising the total possible score from the age-old 1600 points to 2400 points – this new redesign is much more fundamental. It represents a big shift away from the test’s roots as an assessment of an applicant’s aptitude to more of a straightforward knowledge exam, much like its main competitor, the ACT. While the new SAT will be back on the 1600-point scale, with the essay section becoming optional, this won’t be your father’s SAT. On the reading side, gone are analogies like “equanimity is to harried” as “moderation is to dissolute,” what Coleman calls “SAT words,” words in which “the only place you can reliably find them is on an SAT.” Coleman says the new exams will test students’ knowledge of the words they will need to know to succeed in college and career. “When we redesigned the SAT last year, we said goodbye to SAT words, we will instead measure students’ understanding of words they will use over and over again, words that open door in college coursework and career training, words like ‘synthesis’ and ‘analysis’,” said Coleman. Eliminating “SAT words” isn’t the only change to the new reading and writing section, which will require a lot more reading – students will be expected to read nearly 5,000 words and answer almost 100 questions in less than an hour and a half. Students will be asked to decipher the meaning of words in the context of the reading passages and to use evidence from those passages to answer comprehension questions. The passages themselves are changing, as College Board tries to have them represent a range of topics from across the disciplines of social studies, science and history. These changes will sound familiar to those acquainted with the Common Core, though Cyndie Schmeiser, chief of assessment at the College Board, says that kids in Common Core states won’t have an advantage, because the new SAT is based on the same research and evidence that are the backbone to all state’s standards. The math section is also changing. The College Board is replacing logic-based word problems with questions that more directly probe students’ knowledge of mathematical concepts. Like the Common Core, the new test will have a heavy focus on algebra. Coleman has used the same mantra that many supporters of the Common Core’s emphasis on algebra use to justify the narrower focus, saying that the old SAT forced high school math teachers to go “a mile wide and an inch deep” on too many topics. The math test will consist of nearly 60 questions split between two sections, one that allows a calculator and one that doesn’t. The new optional essay is also very much aligned with the Common Core. It will no longer ask students to write an opinion essay but will instead ask them to write an argumentative essay using evidence from yet another reading passage. Even how the test is scored is changing—students will no longer be penalized for guessing and the College Board is cutting a section that was used to test out new questions but was not scored. And like the ACT, students will now have to choose between four possible answers, down from five. In addition to revamping the SAT, Coleman says they are introducing new PSAT tests for eighth-, ninth- and tenth- graders to give students a better sense of whether they are on track for the real thing. Students will be able to feed results from those tests into an online test prep program that the College Board launched this summer with Khan Academy, a non-profit online education outfit. Bob Schaeffer, director of the National Center for Fair & Open Testing Public, says the new PSATs and the changes to the SAT are not about closing the test prep gap, but instead are a response to financial forces. The SAT’s main competitor, the ACT, is increasingly gaining market share and more universities now let students apply without submitting either ACT or SAT scores. The ACT, has outgrown the SAT in part due to their success in getting states to use their tests to fulfill annual federal testing requirements, Schaeffer suspects that with these changes the College Board may be going after that market. In fact, this summer, the Department of Education opened the door for Connecticut and New Hampshire to use the new SAT as their federally mandated annual test.